Visit the Loch Lomond National Park, the Blair Drummond Safari Park, Doune Castle and the Glengoyne distillery from this location. Formerly the shepherd’s cottage, now completely renovated, this delightful semi-detached cottage, accessed by a farm track, is set on a working hill farm, adjacent to the owner’s home and is the perfect base for a relaxing holiday. The enclosed rear garden gives total privacy and stunning views. Fintry, 3 miles, a village tucked high amongst the green and rolling Campsie Hills which provide a backdrop to the other places of interest. Attractions include Loch Lomond National Park, the Blair Drummond Safari Park, Doune Castle and the Glengoyne distillery. Can be booked with W7320. Shop, pub and restaurant 3 miles. Ground floor: Living room with wooden floor/dining room. Bathroom with shower over bath and toilet. First floor: 2 bedrooms: 1 double, 1 twin. Open fire in living room included. Oil central heating and electricity (£10per week May-September, £20per week October-April). Bed linen, towels and Wi-Fi included. Cot. High chair. Stereo/CD. Electric cooker. Microwave. Washing machine. Freezer. Enclosed decked patio and furniture. Portable barbecue. Parking (2 cars). Natural water supply from spring. No smoking. There is a £20 fuel supplement payable Oct - April, £10 May - Sept. Up to one dog only. Access to property is via a rough farm track. 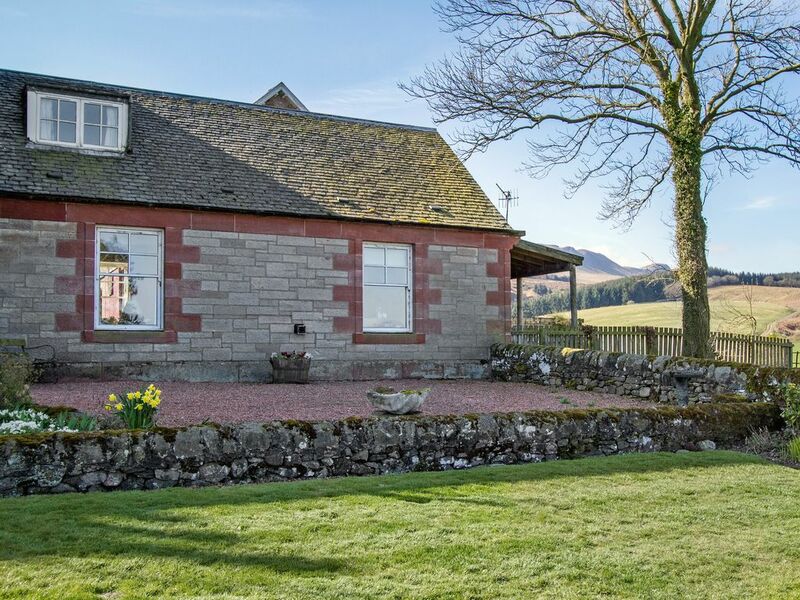 This property is situated on a working farm, therefore pets must be kept on a lead and children must be supervised at all times. There is a natural water supply to this property from a spring.